Event Description For parents and their children age birth to 5 years old. During this 1 hour parent/child workshop, families receive 4 free children's books and explore fun literacy-based activities together. Registration is required, limit of 12 families, please register just one person per family, but bring the whole family! 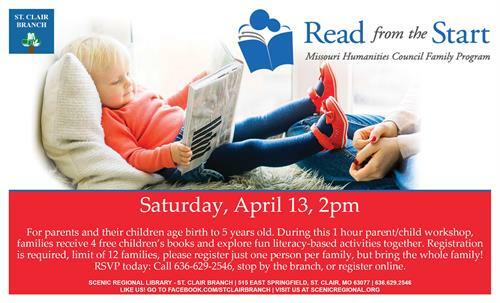 RSVP today: Call 636.629.2546, stop by the branch, or register online.